I am new to Zentangle and am working my way through the tangles in the book, "Joy of Zentangle". I am looking at your tangle called Flora. In the book it is illustrated within a small square and in the last square the petals are cut off by the edges of the square. I can't find any example of this tangle used in any of the illustrations in the book and I am confused as to what to do with it. Is it put together in a ribbon or is it used as one design to fill a space without repeating? Can you give me some help with this or point me in the direction of some Zentangles using this pattern? Many thanks for your help and for sharing your beautiful work. I hope this answers your questions about the tangle in The Joy Of Zentangle book. First, that book was assembled by the publisher by taking random chunks out of other books. If you notice, the "tip" on Flora's page doesn't seem relevant? 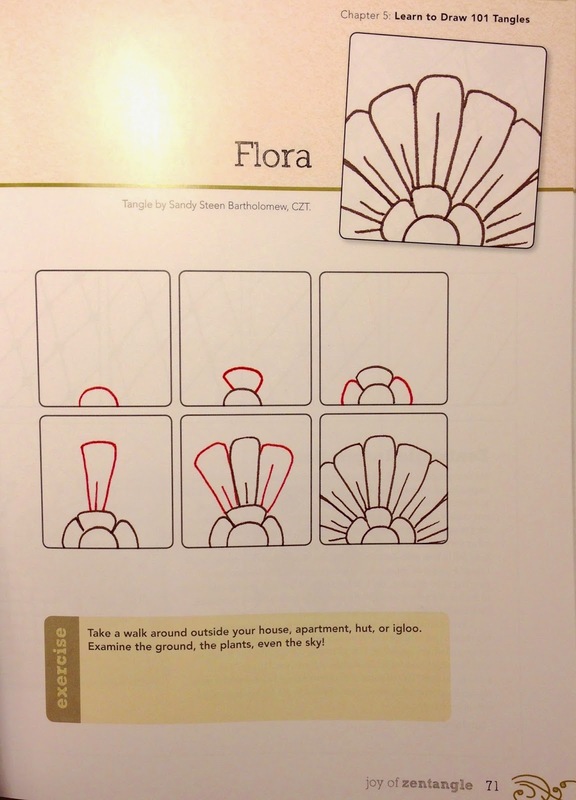 Here is the original page, from my book Totally Tangled , with the steps and examples for Flora. Flora can be used as part of Bauer. Makes more sense, right? Thanks so much for getting back to me, Sandra. I noticed the discrepancies with other tangles as well. ... it is from another of my books - Yoga for Your Brain . 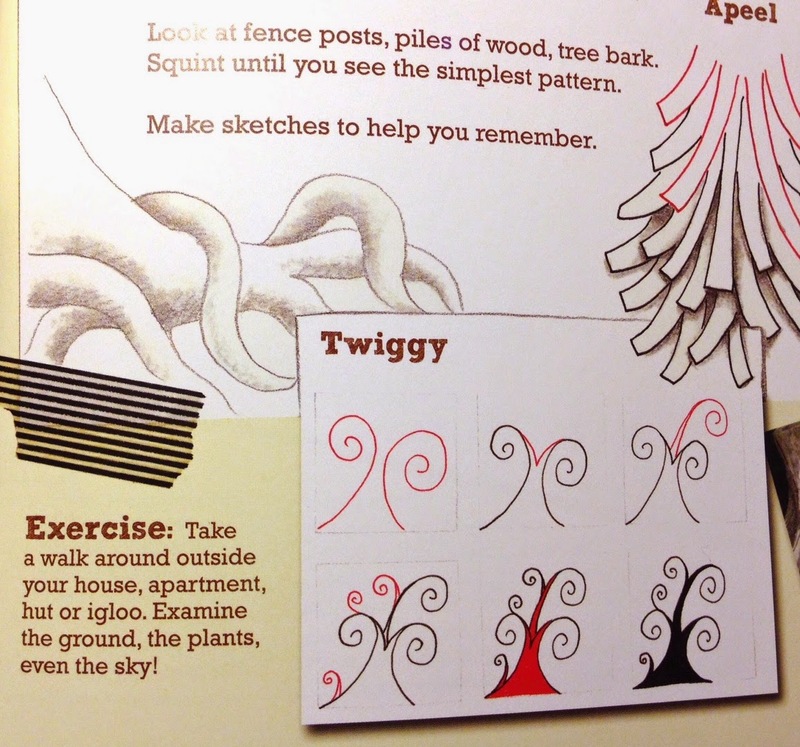 The original page is showing how to use the trees, fence posts, etc that you see around you, as tangle inspiration. Context makes a difference. 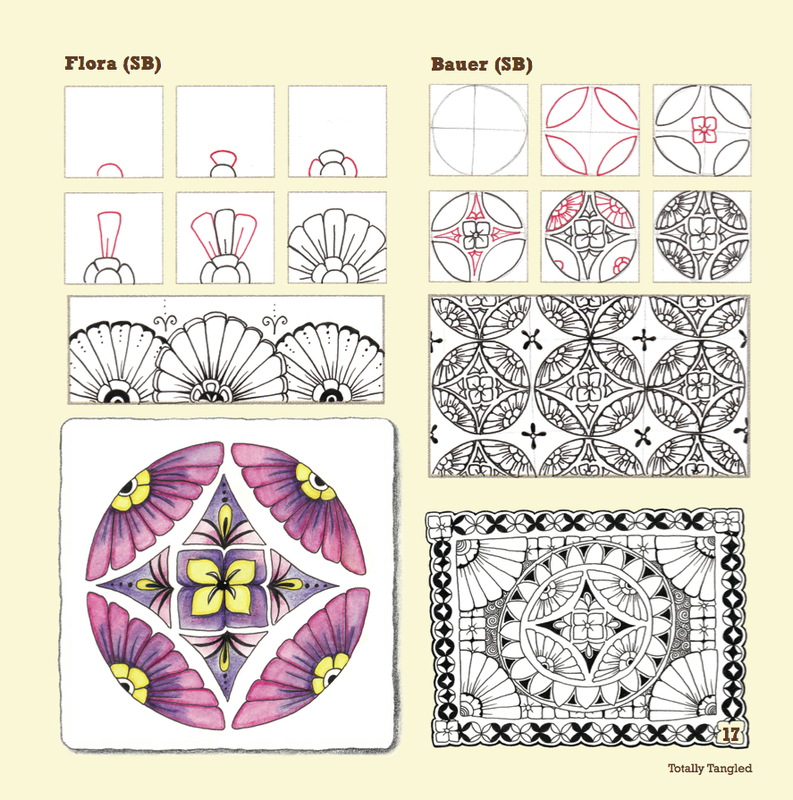 Joy of Zentangle is a great introduction to tangling and talks about the philosophy and stuff - which my books don't really cover. My focus has always been more on the creative confidence aspects of tangling. Lately it has been a bit ...odd... to have to explain to people (and reviewers) that Totally Tangled and Yoga For Your Brain came out BEFORE Joy of Zentangle - not the other way around. So if you are new to tangling, I encourage you to take a look at some of the "older" books too. And please DO let me know if you have questions or would like me to explain other topics - I have had some requests to do some more little videos explaining certain tangles. Anything else? I recently bought your Totally Tangled book; I also have your small Alphabetical Tangle book. These two books have become my favorites and most inspirational books! I have been doing Zentangles for a little over a year and can honestly say I have found the artistic niche I have been looking for for a long time. I daily carve out time to draw and have so enjoyed what it does for me. It's my biggest and best soul-feeding, soul-satisfying activity! Thank you so much for all your hard word.